In a recent series of posts and articles, the OB Rag community has been discussing different aspects of the food industry. From debating the purpose of buying organic or conventional foods to uncovering anti-labor practices at “community friendly” high-end supermarket chain Whole Foods, what has become most abundantly clear from those discussions is that how much someone is willing to spend on food ultimately determines where they purchase it. Just as important, however, is being as educated as possible on what you put into your body in order to enhance your life and stay healthy. Part of that education should include the business principles and moral standing of the places where we buy that food, so that you know what your money is supporting. Recently a debate arose amongst our online community over the pricing strategies and employee turnover at our local co-op as compared to chain supermarkets, in particular Trader Joe’s. There is some question from the community as to how closely People’s co-op is sticking to its founding principles and mission of bringing high quality, healthy food to the OB community at a reasonable price. While that is definitely something that should be of concern to all of us, one thing that cannot be denied about member-owned cooperative food markets is that they represent a stark contrast from supermarket chains in the relationship between people and food. How that relationship will be affected as co-ops evolve and grow seems to be where the greatest challenge will be, and is probably why many people who were present at the beginning of the revolutionary cooperative food movement feel as if maybe it has turned into something unfamiliar – a victim of its own success, so to speak. It is generally agreed upon by human rights advocates that access to healthy food is a human right, particularly as new studies have been able to link malnutrition in children to many of the developmental trends prevalent in impoverished communities. Due to lower income levels, profit-driven supermarket chains tend to avoid inner-city or vast rural communities, giving residents who live there limited access to healthy, affordable food. Authors, activists, community organizations, and hunger experts who have studied these trends have come to the conclusion that many of these communities are essentially “food deserts”. When it comes to food, low-income urban and rural communities tend to be limited by their low-income to a few other lows as well: low quality, low cost, and low nutritional values. A number of markets have popped up in urban areas that target low-income folks by offering affordable prices – but can only do so by offering lower quality foods and products (here is an article examining this dilemma in Central Harlem, New York City). With all that in mind, it is good to know that there are people working to change that. Grassroots organizations in cities across the country have been developing creative ways to raise food standards in urban communities, increase access to healthy and affordable food, and demand fair pricing strategies that meet the needs of their communities. None of this would be necessary, obviously, if basic food needs were not attached to a capitalist industry. The non-profit, co-op model is not only a safe and reliable food source for the community it serves, but also supports people living in food deserts by not contributing to the growth of chains that ignore the basic food needs of poor people. Unfortunately if you happen to be a loyal customer of Trader Joe’s, you are unknowingly contributing to this cycle. 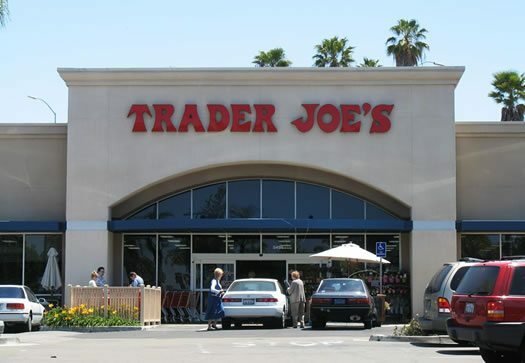 Trader Joe’s is owned by the same German company that owns ALDI discount stores, a chain that operates on the same basic principles as Wal-Mart – that is, cut out the middle and use only a select group of manufacturers that are willing to meet corporate price demands. ALDI operates stores in most of the United States as well as all over Europe, and has gone ahead with planned expansions even during the depressed economy. So how do they do it? Well, simply put, they simplify. Use only one company to provide a certain item, present only that one option for that specific product to the consumer, and market it as an ALDI brand item. By doing this, ALDI is able to sell these items for basement prices. The economic ramifications of this type of strategy is well known due to the impact of Wal-Mart’s growth on American small businesses, but the actual product quality varies dramatically – sometimes from week to week. Products are manufactured by companies all over but the item is labeled as an ALDI product. There is no real way to know how a product was made, what kind of condition the production facilities are in, and in the produce section, where the fruits and vegetables were grown. It is as no-frills as it gets at ALDI, and if you look closely, many of those practices are mirrored at Trader Joe’s. In a co-op or collective environment where profit is NOT the main objective, the barrier between producer and consumer is eliminated, making available all the information we need to make educated decisions about our food. For example, some brands or produce grown at organic “mega farms” carried at People’s (such as Muir Glen and Cascadian Farms, which were once small, family owned companies that have since been bought by corporate giant General Mills) have business principles that educated consumers may be turned off by. But I KNOW that, because I can look into it and research it myself. At a place like ALDI (and Trader Joe’s) that information is kept a secret – forcing consumers to trust that products hand selected by a corporation relying on volume sales are safe and healthy. This makes it impossible for customers to make educated, healthy food decisions that a more transparent business model would allow. That is not to say that the product quality is low at Trader Joe’s – but there is definitely a misrepresentation in the marketing of these products as Trader Joe’s brand and not as products manufactured by individual brands. What I find to be the strangest thing about Trader Joe’s is the low quality of produce in the San Diego stores, particularly the produce that is pre-packaged in plastic. This prevents the instinctive shopping practice of checking fruits and vegetables for rot. When a corporate entity can dictate price levels to farmers and manufacturers while promising high volume purchases in return, quality and freshness will inevitably suffer. Again, the economic repurcussions of that business model on local economies has been typified by Wal-Mart. Even chains like Vons and Ralph’s understand the importance of local produce. Because of ALDI’s inevitable influence Trader Joe’s will continue to offer lower prices, while the competition will be offering folks familiar regional products. Two more stingers for TJ fans: Greenpeace just ranked Trader Joe’s lower than Target and Wal-Mart in regards to seafood sustainability practices and the AFL-CIO’s Solidarity Center has found that one of Trader Joe’s supply chains for shrimp uses child and slave labor. The friendly image that Trader Joe’s portrays of a safe, healthy alternative to organic markets is a very successful marketing ploy. The point of this long, barrage of criticism launched at Trader Joe’s is not meant to point the finger solely at them. There are many other companies who have far lower moral standards and play a bigger role in the cycle of hunger and poverty. Instead, this was meant as a way to present an evidential defense of grassroots food sources over the status quo. This article shows how food sources and supermarket chains interested solely in volume sales can have a destructive impact on local economies – and contribute to hunger in low-income communities. Small local chains like Stump’s and Baron’s are much healthier businesses for San Diego than a Trader Joe’s or a Vons because they do not anticipate operating hundreds of stores; instead they serve local people and cater to a smaller target group, meeting our community food needs and not focusing solely on large scale profit margin. The only way we are going to end domestic and global hunger is to approach food not as a privilege, but as a right. It starts by making educated, ethical decisions about the food we eat and where it comes from. It may cost a few dollars extra to be more thoughtful when buying food, but in the long run it will benefit everyone by strengthening the local economy and empowering communities to make practical decisions about food. Stump’s and Baron’s may be better for the local economy, but don’t have the selection of vegetarian and vegan food that Trader Joes offers. I’d rather shop at the co-op, but that’s not always an option. the whole point is not to focus solely on vegan and vegetarian foods. As someone who does not eat meat myself, it is easy sometimes to forget that we are still the minority. The focus of this article is the misleading tactics of large chains, and how they impact the food cycles of local communities – particularly low-income communities where chains refuse to open stores. Good article Lane. I’ve always done the majority of my grocery shopping at TJ’s. I have had many friends throughout the years who have worked at TJ’s and been extremely happy with their jobs, and I’ve always felt good about shopping there. But I have noticed more and more that their food always has a distinct Trader Joes flavor. Whether I’m eating a frozen pizza or a bag of potato chips. I wonder if that has to do with them using the same source for all of their food stuffs. I also have to admit I have always been turned off by their lousy packaged produce. I bring canvas reusable bags with me wherever I shop and it can feel like a mighty defeat when you fill up your reusable, eco-friendly bag with PLASTIC wrapped food! One step forward, two steps back…? it’s not shocking that trader joes outsources their house brands. it’s common practice, even over at whole (paycheck) foods. i can tell you–and i do have personal knowledge about this– that TJ’s brands are made to very exacting standards when it comes to making sure that known “bad” ingredients are left out of the mix. having lived overseas where grocery shopping choices were extremely limited and quality was nearly always inferior (think about having to buy groceries at K-Mart), i say that it’s easy to lose sight of just how blessed we are in California. i agree that buying “local” is always a better option. but until we have fundamental changes in the way food is bought, sold and distributed in the US, companies like TJ’s are,IMHO, a better option that Ralphs or Albertsons. The other thing to consider about shopping at TJ’s is that their employees seem to be pretty happy about working there…the “vibe” at the store is way better than other chains. Thanks, Lane, for your thoughts on this very important subject. Lane – very good, thought-provoking article. 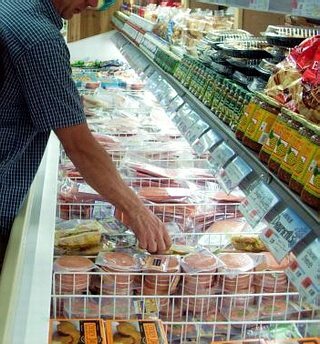 – I DO NOT buy their hamburger or chicken because of too many past bad experiences where they go bad early, nor their fish or shrimp; but their other meats – the pork and marinated chickens, and huge selection of quality pork-less sausages are good, tasty and even awesome. – I too, Lane and Jon, hate their produce packaging. – But their employees do seem happier, and I’ve seen the same faces at the different TJs for years – especially at the lower ends like the checkout clerks. So I think it’s possible to mainly shop at one place at TJ’s and avoid their worst stuff, and still get good inexpensive food. – Much of their produce is overly priced. Why $4 tomato? even if organic? – Peoples’ workers: I see a lot of new faces at the checkout stands when I go there; this translates to me (without more info) to a high-turnover rate. Why is this? low wages? no union? worker alienation from decision-making? – Peoples does have a history of changing its products to fit the damages of its “organic” customers: Peoples fought for years awhile ago to not carry coffee. The same for “sugar” – now look at some of the labels “Real Sugar”… It’s ironic. I think of Peoples as maybe a wayward family member – I love them but want to change. Molly – FM= Famers Market. I should have specified that. There is a small farmers market downtown in the NBC courtyard every Thursday, and although OB’s is far superior, the Downtown San Diego Market offers a selection of local organic steaks and some cheeses. I wish we could get those vendors in OB. I don’t always eat meat, but when I do I would like it to be locally and humanely raised. By the way, happy cows do not come from California. They come from Hawaii. I saw a bunch of them singing, dancing, doing the hula and generally happy. I found a GREAT place for smoothies! As they say, “No frozen fruits, no mystery syrups or sorbets, No concentrated juices and no frozen yogurts with harmful preservatives” I get sick of all the so called Smoothie places, with sugars, additives, preservatives etc! This place is owned and operated by a young couple, Jen & Boris. Charming folks. You can add protein powder OR ginger, (which I love). They sample every one in a tiny cup before they sell it. They are located in the shopping mall on Midway Dr, where Von’s and 24 hour fitness is. Adjacent to the Chase Bank. I hope so much that they MAKE it, I would miss their Terrific food, and they are awesome people, who really have their heads in the right spot. As for all the comments regarding these food stores, unfortunately we have no ideals! Waiting on more comments about Henry’s, where I mostly get my produce, and the great prices on cheese. I always feel good about Trader Joe’s when I go there, and don’t like the produce deal either, nor that they have no bulk bins. People’s, I LOVE,,, (and hear the criticism) I shop the sales there. I sometimes go to Baron’s. but not to often. molly, all of your points are valid. what i meant about low-income communities being ignored by corporates are in neighborhoods where NO supermarkets exist that offer healthy affordable food. in OB/pt loma, you have appletree, barons, stumps, peoples, ralphs, vons, tjs, Henrys – that is at LEAST 8 full service supermarkets serving two fairly small communities. yes there are low-income pockets in our neighborhood – and it should be on the co-op’s radar that this segment of our community is unable to access their food – but OB/Pt. Loma is DEFINITELY NOT a “food desert”. if you want to get healthy food on a tight budget you have a number of options here (just look at the almost daily circulars from stumps or barons) – not to mention that ALL of those stores accept EBT (food stamps). In contrast, try and even find ONE market like those in low income pockets of south san diego, city heights, escondido, oceanside, National city, dulzura, etc. we are very lucky here to have so many food options. by comparing our neighborhood as blue collar as it is (and i can attest to this by my own monthly money struggles) to actual food deserts, you are misplacing the truth and ignoring the basis of the article. this 4 dollar tomato thing keeps coming up, and i have to say that i have never paid that much for a single tomato at peoples. i find that their prices are definitely higher, but again, my bill ends up being very comparable when I do all my shopping there than when I used to split it up between various stores. it is, of course a personal preference – and i dont eat meat, so it makes things a little easier for me to shop at a cruelty free store. if you want to know more about my personal food budget, i can break down exactly how much my girlfriend and I spend on food each week and you will see it probably isnt much different than what most people who cook all their meals and never eat out spend on food on a weekly basis. again, we are not living in a neighborhood that lacks affordable food outlets – barons and stumps are LOCAL businesses, not corporate chains. so the option is there for people who cant afford to shop at our community co-op – however disheartening it is to know that some Obecians cant shop there, we really have no right to complain about our options. Lane – sorry, I didn’t mean to ignore the main point of your article – and I totally agree with it. I have worked in those neighborhoods and it’s a crime that major food stores avoid the poorer neighborhoods. It was just that your article gave me a place to rant, and I tried to sum up a lot of what people have said in these discussions about food stores in our locale, and in general. Plus I wanted to explain how I see Trader Joes and Peoples. Well, maybe my experience with that $4 tomato really soured me. I was feeling poor and love tomatoes and to run across this one at Peoples really just was ingrained in me memory. Genie, yeah, when is the “expose” of Henry’s coming, Lane? too late buddy. trader joes corporate, general mills and safeway have all shown up in our visitors stats today…. keep up the good work! lane: And you made some great points. I would rather shop local, non chains whenever I can. But if a local place isn’t going to cater to my needs I have to go elsewhere. Which is why I am so happy to have Peoples. Some of their prices may be a little higher, but the produce quality is very high, and I’d say worth it. I was unaware of many of the facts you mentioned about TJs, I have to rethink shopping there. WOW thanks Geniezuc for Commenting about our Store, Nature’s Ambrosia! We are Just trying to offer healthier alternatives other then “Jamba Junk” and other places that sell frozen fruits and call themselves healthy. We are OB locals and hire only LOCALS (OB OR PL) so that we can keep our community healthy. Eventually we will have more veggies in here and want to get them from Community Supported Agriculture. Come by and take a look at our menu and help support locals that care about our earth, and our community! It’s always a balancing act. It’s always an effort to be aware and to act accordingly. Lane’s article is both good and necessary, because our concerns and our voice truly can make a difference. As someone in the Third Act of life, I have come to take a different view of how I would have seen things in the First and Second act. I don’t want this to come across as an apologia, but there is a big picture of which I am aware. Life is complex and it is a sort of balancing act. The reality is that I don’t have any second thoughts about going to Trader Joe’s this weekend. I take a bus to work five days a week. Use minimal water. Turn off the lights and I’ve planted a big tree in the back yard to keep the house cool. No kids. A pretty small carbon footprint. I would however like to be able to recycle every piece of plastic I get from Trader Joe’s. I definitely don’t want them to use child labor. This is not about being pure or perfect, but rather about enjoying what is wonderful and sustaining about life without a horrific cost to the people and animals with whom we share this planet. So thanks Lane. Let’s make Trader Joe’s a better place to shop. anna – nailed it right on the head. we can support the places we feel most comfortable AND demand a higher moral standing out of them. i think one of the underlying themes here is that trader joe’s employees seem to be happier and more helpful than any other place. clearly there is something to be said about customer service. I totally identify with annagrace’s and Doug’s Trader Joe’s observations. On the produce, I only buy canteloupe there, it is not wrapped in anything, and blueberries which always seem to be in plastic anywhere. I want to say a kind word about their condiments and dressings and marinades (good ingredients and mostly great taste), their canned stuff, beans, tomatoes, etc. are frequently organic always pretty good, so is their coffee and cookies (I love cookies). I am sorry they have trended towards everything on their own label . . . they used to have their sources’ label up to a few years ago and a notation that TJs is sole distributor. I think their purchasers are the real talent . . . they find good stuff and sign generous exclusive contracts with small-ish producers. I do wonder what percent of their foods still comes from such small producers. A few years ago I moved to a small town north and east of Redding after being a TJ fan in the Bay area. In my town there is only Safeway, and nothing else for 40-50 miles except convenience stores at gas stations. TJ came to Redding May 1st. When they began hiring over 2000 people lined up for applications. The store is attracting huge numbers of shoppers, many still checking it out, many of who have been wondering what took TJ so long. And I, I am happier to drive 50 miles to TJs than a half-mile to Safeway. Though I am a TJ fan I still aqree with Lane that supporting good affordable local food sources is really a major social goal.